Easier and Cheaper to Set Up Than Raised Beds! 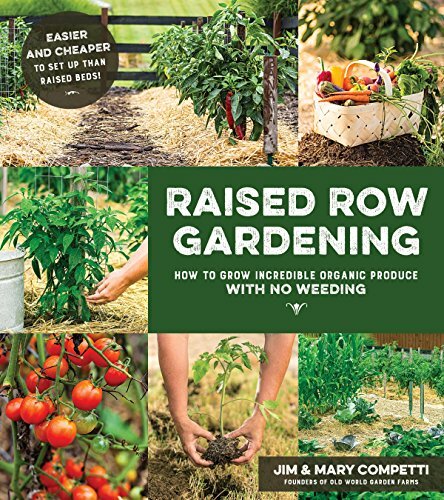 For homeowners young and old looking for the easiest and most affordable way to grow the most vegetables, the Raised Row method shared in this breakthrough book is the new go-to choice. In the past decade, raised bed gardening has been wildly popular, but it requires buying wood or another material to build the raised beds, which quickly becomes expensive and labor intense. A raised row garden uses just soil and mulch, such as shredded leaves, to create raised growing rows and walking rows. This method is more budget-friendly, natural and just as effective to control weeds and see an impressive harvest your first year. Jim and Mary Competti, founders of the blog Old World Garden Farms, are the leaders of this gardening revolution. They’ve perfected and streamlined their method over several years. They spend only a few minutes per day maintaining a large garden that provides their family with food for the whole year. In this book, they share their secrets so anyone can do it too. Raised rows utilize straw mulch, compost and cover crops to enrich the soil you have and keep down weeds naturally. This way, no backbreaking overturning of the beds is required, as it is for traditional row gardening. Now, readers can work less and enjoy the fruits of their gardens more! If you have any questions about this product by Page Street Publishing, contact us by completing and submitting the form below. If you are looking for a specif part number, please include it with your message.